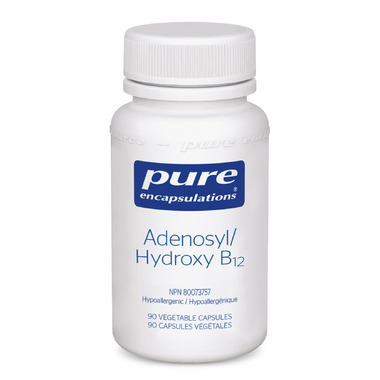 Pure Encapsulations Adenosyl Hydroxy B12 is a unique blend of adenosylcobalamin and hydroxycobalamin, offering unmethylated vitamin B12 to support energy production and normal immune function. Pure Encapsulations Adenosyl Hydroxy B12 is a unique blend of adenosylcobalamin and hydroxycobalamin, offering unmethylated vitamin B12 to support energy production and normal immune function. Hydroxycobalamin is a precursor form of vitamin B12 converted in the body to both methylcobalamin and adenosylcobalamin. It is similar to cyanocobalamin without the cyanide moiety. Adenosylcobalamin is an activated form similar to methylcobalamin. While methylcobalamin is found in the cytosol of cells and predominates in blood and other fluids, adenosylcobalamin is the major form of vitamin B12 stored in the mitochondria of cellular tissues. It is a key cofactor in carbohydrate metabolism for the enzyme methylmalonyl-CoA mutase used to produce succinyl-CoA. Optimal levels also support red blood cell formation and normal immune function.